MotoGP Americas: A Rossi Rush-style movie? 'Maybe with Biaggi'. "Maybe with Biaggi, I don't know... Was funny because also we had a lot of funny stories out of the track! The theme song? Sincerely difficult to say... You decide!" Race day gains have carried Valentino Rossi from the third and fourth row on the grid to podium finishes in the opening MotoGP rounds, putting him behind only unbeaten Yamaha team-mate Maverick Vinales heading into Austin. But such results would be easier for The Doctor to achieve if front-end handling difficulties could be improved much earlier in the weekend. "The winter tests were not fantastic and we continued to suffer also during practice. But two good races, two times on the podium and good points for the championship. 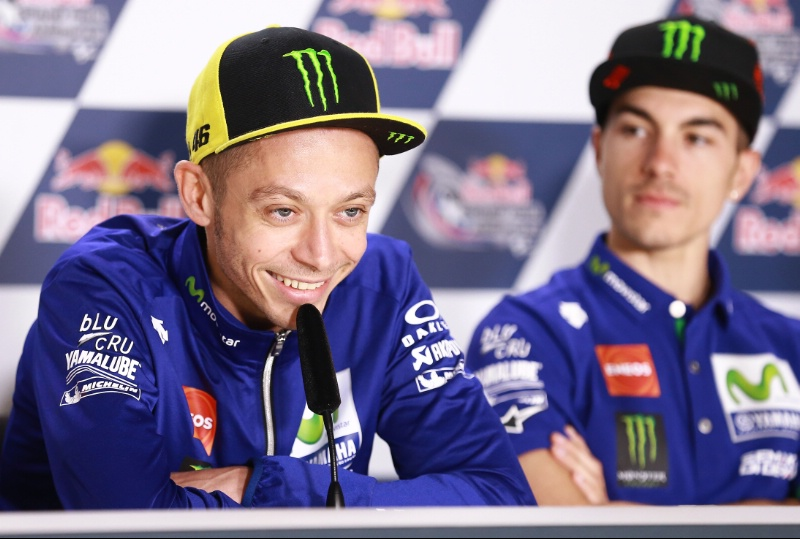 So a good start," Rossi declared on Thursday in Austin. "But after Qatar I expected to arrive in Argentina and be faster during practice, but I struggled too much. So we have to try to understand if what we learned about the bike in Argentina can help us also on Friday and Saturday here." "Now we just wait for tomorrow morning."